A hot air balloon ride over the Serengeti plains in Tanzania and Masai Mara Kenya is a truly magnificent experience. Visitors to the Masai Mara, Serengeti can experience the rare excitement of game viewing from a hot air balloon. In the crisp air of dawn, the passengers drink coffee while the crew partially inflates the balloon with enormous fans. The gas burners are then ignited and the balloon fills with hot air slowly raising the baskets. Before departing, finalized checks are made, and the passengers then climb into the balloon basket for a takeoff. At the end of the flight, the passengers are treated to a champagne breakfast, complete with flowers. China and crystal are set out on the table that is placed under a convenient acacia tree. The finishing touch to the flight is a game drive back to the lodge or camp, and the possibility of seeing the same pride of lions, or herd of elephants that had been viewed while ballooning. Over a dozen balloons depart from sites near six of the lodges and tented camps. Our customers are often able to view four of the ‘Big Five’ while ballooning. A flight certificate is issued on completion of the balloon safari. Package: Easily incorporated into any Safari itinerary which includes at least one night in Maasai Mara, or Central Serengeti. 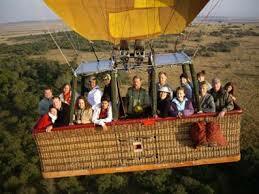 NB: Pick-ups from lodges/camps are done at no extra cost and the the hot air balloon rides are operated daily. To reserve hot air balloon ride, please contact us and remember to specify location and number of individuals.